In 1999, a major section of the Malden Hospital operations was shuttered as was documented by Department of Health and Human Services OFFICE OF INSPECTOR GENERAL. It was reported that "The closure of hospitals in past years has generated public and congressional concern. We released a report in May 1989 describing the nationwide phenomenon of hospital closure in 1987. Subsequently, we issued annual reports for hospital closures from 1988 through 1998." The report states that "Sixty-four hospitals closed in 1999 -- 1.3 percent of all hospitals nationally. " In 1999, Malden Hospital was one of three urban hospitals that closed in Massachusetts that year. 6/14/01 - Minutes of the Board of Trustees of Mystic Valley Regional Charter School met and "discussed the pending purchase of the Malden Medical Center (counsel to obtain minutes of special meeting(s) called for that purpose). We should know whether we are acceptable bid within about 30 days. There was a prior vote to seek the funding and authorize the school to bid for the purchase..."
6/25/01 - Minutes of the Board of Trustees of Mystic Valley Regional Charter Schoo indicate "The Board discussed the pending negotations or the Malden Medical Center. The Mayor preferred taht the purchaser need no zoning relief; our school would not need any zoning change to operate there, so we believe we have a good chance of acquiring the building. Some other bidders in construction of housing were unlikely winnes. Discussions but some Board members with Easter Bank proved unsatisfactory, as Eastern seemed unfamiliar with school acquisitions. They wanted no letter of credit, while Tucker Anthony, an invesment banker, needed one. Also, the Tucker Anthony fees seemed higher. But Tucker Anthony seemed at ease with the entire project, had a great deal of experience with substantial school acquisitions, and saw no stumbling blocks for our acquistion of the building. The parties are still negotiating price and rent. Tucker Anthony's fee is 1.5% plus lawyer's fees, costs and expenses. After discussion, it was MOVED, SECONDED, and unanimously VOTED: to retain Tucker Antyony as investment banker for all purposes relative to the Malden Medical Center acquisition. After discussion, it was MOVED, SECONDED and unanimously VOTED: To form a subcommittee, chaired by Mr. Brennan, who shall designate members thereof, to negotiate and handle all related matters involving the Malden Medical Cener acquisition, other than signing a Purchase & Sales Agreement (which will be presented to the Board for review and vote). The total cost of the package would be about $9.5 Million, with 7 Million to buy and $2.5 Million to renovate and retrofit." "In 2005 the City of Malden issued a special permit for a 300-unit CCRC facility on this 18-acre development site and the City of Malden has recently indicated that the special permit should be easily renewed if a qualified development firm submits a plan that is similar in the scope and scale to the plan submitted by the former development team." 2007 and 2008 - The permit, and the potential development at the Malden Hospital site, proposed by Beth Israel Deaconness Continuing Care, was likely impacted by the Real Estate Market crash which took place in the 2007 and 2008 timeframe. The proposed deal dissolved. 9/15/13 - The Malden Observer reported "Malden officials want old hospital building gone". The story reports, "The issue was raised before the Malden City Council on Sept. 3 by Councilor Criag Spadafora, who proposed a resolution that the city considers taking the property by eminent domain." It continues, "The resoution was jointly sponsored by Spadafora and Ward 3 Councilor John Matheson, who represents much of the est End on the City Council." The article inicates the outcome of this action ws "The non-binding resolution tabled on Sept. 3, and city officials are now plannign to meet with Hallmark Health to discuss the issue." 10/18/2013 - Lawsuit “1381CV04563 Hallmark Health System Inc. vs. City Of Malden et al”, initiated in the approximate timeframe of 10/18/2013, https://www.masscourts.org. This would eventually be settled by jury decision in 2017.
" NEIGHBORHOOD MEETING 11/19/2014 6:30 PM - 7:30 PM Mayor Gary Christenson and City Councillors John Matheson, Craig Spadafora, David D’Arcangelo and Debbie DeMaria will hold a meeting for residents on: Wednesday, November 19th at 6:30 PM, Beebe School Auditorium, 401 Pleasant Street The meeting is to introduce Fellsmere Housing Group’s proposal for the vacant Malden Hospital site. Fellsmere Housing Group (Tony Green, Bill Cress and Charlie Coolidge) will present a proposal for the potential purchase of the Malden Hospital site from Hallmark Healthcare for a mix of residential uses: assisted living apartments, conventional apartments, condominiums, and single family cottages, all to be built where buildings and parking exist today, while preserving the established surrounding tree buffer. We hope to see you there. " 6/16/15 - 387-15 On agenda:	6/16/2015	Communication and petition from the Fellsmere Heights Neighborhood Association (later to be known as Friends of Fellsmere Heights or FOFH) regarding the former Malden Hospital site. At one point, in the June 16, 2015 meeting long-time Councillor Craig Spadafora asked: “How is this Attorney Client Privilege?” “What Attorney?” Here are some notes (see video - https://youtu.be/cmxrKzdaVPo - A lot happened at this meeting! Spadafora and D’Arcangelo make clear their concerns about the ambiguity of this Appraisal work. Matheson states: “This is only in order to get a value of property in order to have a discussion”. 6/23/15 - Friends of Fellsmere Heights (FOFH) address the Council relative to redevelopment of the Malden Hospital Site. From the Minutes, "Prisco Tammaro of 56 Pine St. and Robert Doolittle, members of the Friends of Fellsmere Heights, addressed the City Council relative to redevelopment of the Malden Hospital site." 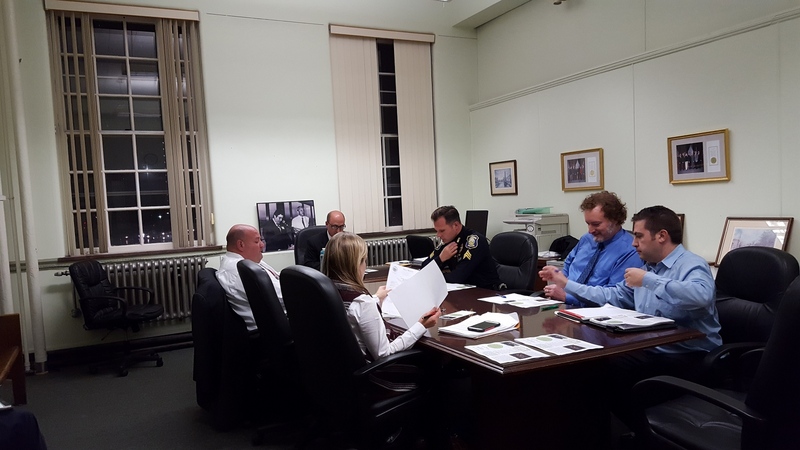 6/23/15, from the minutes, 118-15 came before the Council, Order: that the Finance Committee meet with the Executive Director of the Malden Redevelopment Authority relative to the Malden Hospital site", with sponsors D'Arcangelo, Matheson and Kinnon. The Minutes read, "A motion was made by Councillor D'Arcangelo that the Order be taken from the table. The motion carried by a unanimous vote." Then, it reads, "On a motion by Councillor D'Arcangelo, the Council voted by unanimous roll call vote to go into Executive Session to for the purpose of discussing the appraisal requested in Paper #118-15. The Council President declared that open discussion would be detrimental to the city's negotiating position. The meeting was recessed and executive session convened at 7:40 p.m. The executive session was adjoured and the open meeting reconvened at 9:05 pm." Discussion on this item appears to have continued in open session, where the Minutes read "A motion was made by Councillor D'Arcangelo that the proposed amendment be withrdawn. The motion carried by a unanimous vote." This discussion continued, "A motion was made by Councillor D'Arcangelo that the Order be amended to read as follows: Ordered: That the City Council request the Executive Director of the Malden Redevelopment Authority to conduct an appraisal with respect to the Malden Hospital site at a cost not to exceed $9,000.00. The motion carried by a unanimous vote." 8/3/15 - "This should be preserved"
10/31/15 - Inquiry about September 22, 2015 Letter sent from Hallmark Health to City Council RE Purchase and Sale of Hospital Site. A subsequent public records request seeking release of this letter was initially denied but honored upon appeal to the State. 12/8/15 - From the City Council Meeting Minutes - Final December 8, 2015 665-15 Order: That the City Council meet in executive session to discuss appraisal of the Malden Hospital property. Sponsors: John P. Matheson, File #:	665-15 File created:	11/24/2015	In control:	Committee of the Whole On agenda:	12/8/2015	Final action:	12/8/2015 Title:	Order: That the City Council meet in executive session to discuss appraisal of the Malden Hospital property. A motion was made by Council President Matheson that the Order be adopted. The motion carried by the following vote: Yea: Anderson, Crowe, D'Arcangelo, DeMaria, Kinnon, Murphy, Nestor, Sica, Spadafora and Matheson The Council President declared that open discussion of relocation of City Hall Offices and the Malden Hospital appraisal report would be detrimental to the city's negotiating position. 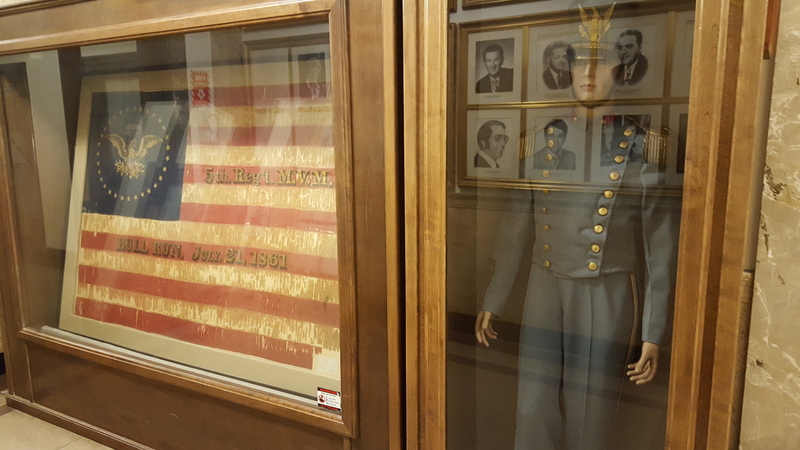 The open meeting was recessed and executive session convened at 7:45 p.m. Executive session was adjourned and the open meeting reconvened at 8:43 p.m.
12/24/15 - Historical Flashback - "On the Road to Malden Hospital"
11/18/16 - Citizen initiated Tour of Hospital Site - Fellsmere Housing Group provided tour and expressed willingness to speak with anyone else who might have questions. "Before calling it a day Thursday, (Judge) Henry gave the parties one last nudge to discuss a settlement. "If you resolve it short of [March 13]," he said, "you'll make us happy, too." 12/22/16 - Advocate Newspaper covers the topic in a thoughtful piece entitled "Residents question the impact of development on city schools"
In early February 2017, Hallmark Health reportedly filed "preliminary petitions" to subdivide the property known ad the "old Malden Hospital site". 2/8/17 - Hallmark Health prepares contingency plan on Malden Hospital site - "The City Council has spoken in recent years about the possibility of taking some of the 21-acre site by eminent domain, but there are currently no such papers before the council and Matheson said he no longer foresees that path being taken." 3/8/17 - a Planning Board meeting reviewed subdivision plans at the hospital site. The planning documents were photographed and can be found at this link. The subdivision plans were not approved. Related documents can be found for the 57 Hospital Road decision, the 100 Hospital Road decision, and the preliminary staff report used in the planning board review of the subdivision plan. On or about March 23, 2017, a Superior Court decision was reached in the testy trial of Hallmark Health System Inc vs City Of Malden et al, 1381CV04563 The proceedings involved a judge, a dozen jurors, a couple of expert witnesses, several past or present city employees, a councillor, executives from Hallmark Health, loads of lawyers and big budgets for case preparation. After a short deliberation of about two hours, the jury ruled in favor of Hallmark.You can find links to related reporting here. 5/11/17 - "What will happen to the old Malden Hospital site?" reported by the Boston Globe, "In 2013, Malden ordered Hallmark to make repairs to the structure, including upgrades to the sprinkler and fire alarm systems. Hallmark balked, saying the building was safe, and sued the city. Get Fast Forward in your inbox: Forget yesterday's news. Get what you need today in this early-morning email. Enter email address Sign Up In March, a jury determined Hallmark did not have to complete the repairs. The city will not appeal, Mayor Gary Christenson said." 11/17/17 - Order 466-17 was sponsored by Councillor Matheson, "That the City Council establish an Ad Hoc Committee on Malden Hospital Site Development." Minutes of that meeting indicate that "A motion was made by Councillor Matheson that the Order be adopted and an Ad Hoc committee on Malden Hospital Site Development, consisting of four Councillors and one resident be formed. The motion carried by a unanimous vote." Years earlier, in approximately February 2015, the same Chair (prior to the establishment of the MHSDC) met in a closed meeting with a different resident and the Fellsmere Housing Group at City Hall. January 2018, Malden's Mayor Gary Christenson wrote a letter to the council encouraging a review of the Fellsmere Housing Group's proposal for the hospital site. 1/3/18 - WHAT SHOULD BE BUILT AT THE OLD MALDEN HOSPITAL SITE? A NEW COMMITTEE WILL DECIDE - "The Jan. 16 ad hoc Committee on Malden Hospital Site Development is expected to be held before the Malden City Council meeting." 1/16/18 - The Malden Hospital Site Development Committee met with an agenda as posted at https://cityofmalden.legistar.com/Calendar.aspx The agenda is here. The meetnig minutes as initially posted are here, however, they need to be updated with corrections. 1/23/18 - meeting, a communication was read from the Mayor regarding the Malden Hospital Site. The letter stated: "I am requesting that the City Council refer this matter to the Hospital Site Review Committee for public discussion since this committee is tasked with identifying and recommending proposals that make sense for our community." The letter continued describing the overall importance and scope of this matter: "From a financial perspective, the level of private investment will approach $100 million and when completed, the project will generate an estimated $1.2M in tax revenue after expenses on an annual basis. The proposal also includes nearly $500,000 in one-time infrastructure improvements that could be used to make further enhancements to the nearby pond and park and/or be used for affordable housing. Moreover, I believe that this proposal will be attractive to the state and serve as a catalyst to the City's ability to seek Massworks funding for associated infrastructure improvements ..." That letter is linked to here. Itemlive covered this story (on 1/25/18): "Developer Makes a New Bid for the Old Malden Hospital Site", at this link. 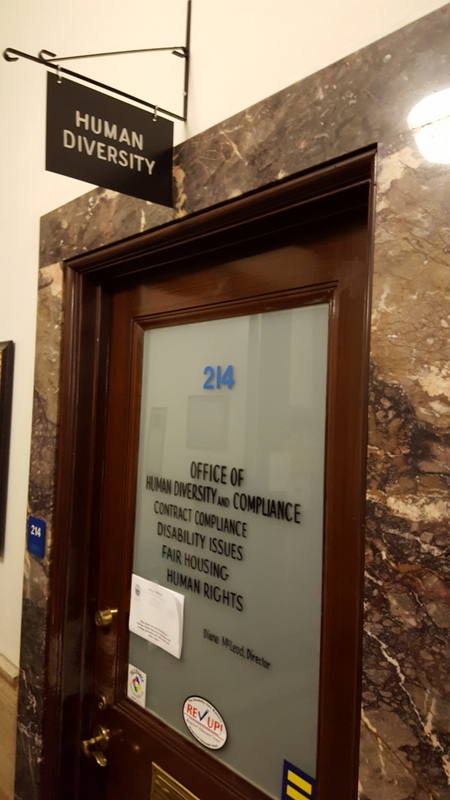 Two members of the Malden Hospital Site Deveopment Committee (MHSDC) - the Chair and the Resident Member - met privately with Fellsmere Housing Group, not in open meeting and without other members of the MHSDC. As of July,no further public discussion reviewing the Fellsmere Housing Group plan was taken up by the Malden Hospital Site Development Committee, as anticipated by the Mayor's letter of 1/23/18. February 28, 2018 - The Malden Hospital Site Development Committee held a meeting with agenda posted at https://cityofmalden.legistar.com/Calendar.aspx - The agenda is here. 3/28/18 - The Malden Hospital Site Development Committee held a meeting with agenda posted at https://cityofmalden.legistar.com/Calendar.aspx - The agenda is here. You can see additional notes at https://www.facebook.com/MaldenNewsNetwork/posts/2011910725714256. A letter was read into the record from Secretary Jay Ash of the Executive Office of Housing & Economic Development. A transcript is here, and a scanned copy of the letter is here. The meeting opened with the City Clerk reading a letter sent from Mass Works to Mayor Christenson into the record (https://www.mass.gov/service-details/massworks). That letter offered financial support from the state to the City of Malden - in the amount of $2.5M - tied to the redevelopment of the Malden Hospital site. 4/17/18 - item 224-18 was introduced by At-Large Coucnillor Craig Spadafora during the City Council meeting. The action called for "The Fellsmere Housing Group and Friends of Fellsmere Heights to present their proposal of a zoning overlay allowing clustered mixed of residential housing at the former Malden Hospital Site to the Rules & Ordinance Committee." Councillor John Matheson moved to table the item, which was seconded by Councillor Barbara Murphy, and it was tabled. 4/23/18 - Brian DeLacey met with Mayor Christensonr, Deborah Burke and Ron Hogan to discuss and review "Fellsmere: It takes a Village. This was the underlying framework for what would become the "Hospital Hill" plan to be released within the week. 4/27/18 - Details of a new proposal, titled "Hospital Hill" were shared publicly. You can find those early details at this link. On May 1, 2018, the "Hospital Hill" proposal was formally submitted to the Clerk of Committeees with copies to Council members on the evening of this City Council meeting. 6/5/18 - City Council President Debbie DeMaria, Councillor John Matheson, former Malden City Clerk Karen Anderson met with Bobbi Carbone, MD, MBA Interim President and CEO, MelroseWakefield Healthcare - City officials meet with representatives of Malden Hospital and discuss various topics, reportedly including zoning. The President of Friends of Fellsmere Heights (FOFH), spoke in opposition to untabling, favoring to leave legislative initiatve 224-18 tabled..
6/27/18 - the Ward 3 Councillor held a ward meeting and unveiled and advocated for his own development proposal at the hospital site which he referred to as "The Matheson Plan". This was held after the last Council meeting before summer recess. The plan requires zoning changes. See http://www.maldenhistory.org/W3June2018/. 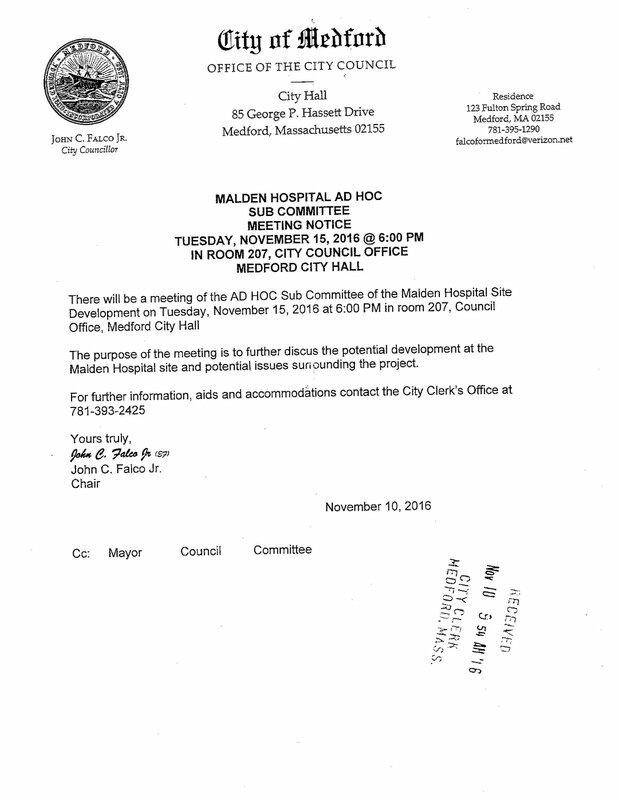 7/4/18 -, three meetings of the Malden Hospital Site Development Committee (MHSDC) were held between its establishment in Nov 2017 and July 4, 2018. No committee minutes had been posted during this seven month timeframe. (See link.) Written requests were submitted seeking minutes. 7/26/18 - only minutes for the Januuary 16, 2018 MHSDC meeting had been posted. 2/11/19 - Councillor Ryan O’Malley revealed a proposal/presentation which was in circulation and discussion amongst city officials. This proposal involved a joint effort and coordinated actviity between the city of Malden and the Mystic Valley Regional Charter School to acquire the Malden Hospital property. This plan was reportedly prepared by a Mystic Valley Regional Charter School (MVRCS) board member who is a former Malden city councillor. The plan has reportedly been then discussed and shared itwith Malden city official and Friends of Fellsmere Heights. This is referred to as the “NK-MVRCS Plan”.